While I read the general information about a ferry transfer from St. Maarten to Anguilla at Stmartinbookings.com, few small details still alluded me. As such, I have written a post for the first timers who are flying into the airport at Simpson Bay on the dutch side of St. Maarten, and need to get to Anguilla. Having the hotel book on my behalf was likely good in case I had a problem since they have a relationship. Having said that, I didn’t get a discounted rate like my hotel suggested. I paid the full $65. In addition, it is important to advise the hotel to select the ferry based on departure and arrival times rather than by the preferred carrier. Of the three privately owned ferry companies, I ended up on GB Ferry. In my experience, the GB Ferry departs 15 minutes after the scheduled time. Most people use the other two ferry companies, Calypso and Funtime, likely because they are included on an aggregate site called StMartinBookings.com and GB Ferry is not. The cabins on these ferries are not fully enclosed like GB Ferry. Because most people use the Calypso and Funtime, I had the entire GB Ferry to myself on my return shuttle to St. Martin. No cramped quarters. All the ferries operated by private companies offer complimentary refreshments and arrive at the Blowing Point Ferry Terminal. Private charters from the ferry companies are available. 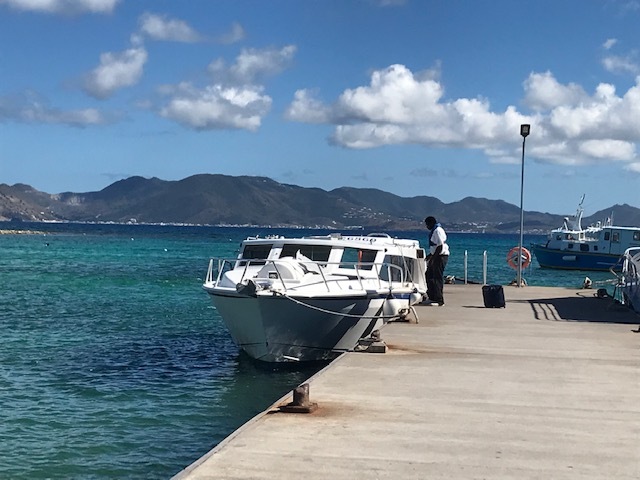 Public ferries are available for less money, but they require a taxi ride to a different dock and arrive at a different dock in Anguilla. For convenience, most vacationers take the above-mentioned ferries. Have lots of tip money ready. There is a driver, a porter that unloads the bags at the ferry terminal, and the boat crew. They all expect a tip. The porter doesn’t have a salary and does the most bag toting…likely the most deserving. There is immigration in the airport and at both the departure and arrival terminals. The ferry companies require arriving 10 minutes before the departure time from St. Maarten and 30 minutes before the departure time in Anguilla as there is a departure tax that needs to be paid at a separate window. The ferry ride is approximately 30 minutes eventhough they say 20 minutes. There is a taxi desk at the Anguilla terminal. The taxi rates are set by zone. Taxis are EXPENSIVE and only take cash. Whoever wrote on TripAdvisor that they are cheap, likely got rides within the same zone and probably didn’t travel more than a mile for $8. It is MUCH cheaper to rent a car for $35/day. Just beware that Anguilla is owned by England so driving takes place on the left. If staying in the quieter, northeast side of the island such as Shoal Bay, renting a car is advised.